The red, white, and blue colors of the American flag have remained the same throughout its history. However, the design evolved as America expanded from 13 to 50 states. The 50 stars on the current flag represent the 50 states of the country, and the 13 red and white stripes stand for the original 13 states at the time of independence from Great Britain in 1776. The design of the new American flag was originally approved in Washington D.C. on June 14, 1777. It specified that the flag would contain 13 white stars on a blue background and 13 red and white stripes—one star and one stripe for each state. The precise layout of the stars and stripes may have been suggested by Betsy Ross, a seamstress from Philadelphia, who was asked to make the first American flag. Today, the stars on the American flag symbolize the collective strength of 50 individual states. Its stripes represent the brave foundation of the first 13 states. Introduce your national flag to the world, including colors, symbols, things you can count, the meaning behind them, what the national flag means to you, and any story that you know about your flag. Does your country celebrate Flag Day? Do you have a similar holiday? How do you celebrate on this day? For this activity, you will need to show your students images of the first American flag and the current American flag. You may want to find these images prior to class. You can find the first one easily by searching “first American flag” on the Internet. It will show you many images of American flags. The majority will be the correct first American flag with the thirteen stars in a circle on blue. Save the image for the second part of the activity to show the students after they have invented their own flag. Have students find information on the design of the first American flag from the above reading. Then, put them in small groups and ask each group to use what they read to imagine the first American flag and to draw it on a piece of paper. Once they have finished drawing, show them a picture of the original flag and ask them to compare it with their drawings. Next, show a picture of the current American flag, and have them discuss whether it was a good decision to change its design. Bring the class back together and ask each group their opinion about changing the American flag. Follow up by asking the students to research the history of their own national flag to find out if it has also gone through changes. If so, have them find the reasons for the changes in their own country’s flag. 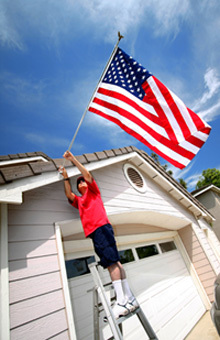 Have your students read the Presidential Proclamation from 2012 on Flag Day and National Flag Week. Prepare a link to an online dictionary or a set of paper dictionaries, in case students need to look up some difficult words. Then, ask them to work in small groups to identify and take notes on what each paragraph is about. For example, the first paragraph is about the origin of Flag Day while the second one is about the meaning of the American flag and its uses. Once they figure out the key points, have them discuss the organization of the speech by looking at how the president begins the speech, how he introduces the main points, and how he ends the speech. Next, have students research the history and meaning of their own national flag and write a proclamation that your country’s leader could give if he or she wanted to make a speech similar to Obama’s. If the home country does not have a national Flag Day, ask your students to imagine one and decide on a good date for such a celebration based on the history of the country.